Inspired by the striking fields and beaches of his home town in South East Kent local contemporary landscape artist Anthony Giles has created a series of paintings for a solo exhibition entitled Illuminating the Elements. 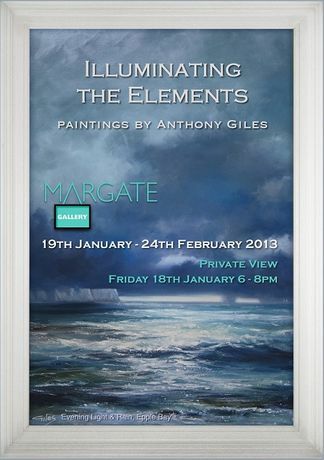 It will be held at the Margate Gallery from the 19th January to the 24th February 2013. The exhibition will feature approximately 20 paintings collectively revealing Anthony Giles's remarkable technique for capturing atmosphere, light and colour. The paintings have been created mostly âen plein' with final touches made in his studio. Illuminating the Elements promises an engaging look at the artists' extraordinary interpretation of British and local scenery. This exhibition will coincide with the creation of a 36ft canvas painting of Margate at the Harbour Arm Gallery to raise funds at auction for Pilgrims Hospices in early January 2013. Illuminating the Elements exhibition opens on Friday 18th January 2013 from 6-8pm and you are cordially invited to attend.